On our second day in Guatemala we got up at 5:30 a.m. to drive the 30 km north through Tikal National Park to the Tikal ruins. As mentioned, this road was only paved in 1980 or so. Another example of how the nation is being knitted together. The early start was to have as much time as possible at the site in daylight and hopefully to see morning wildlife as well. The approach road had lots of signs warning drivers not to hit various animals and birds but unfortunately for us it was their day off; we saw nothing. In spite of our early start, we weren't walking up through the forest to the site until 7:30 a.m. We weren’t the first to arrive, but there weren’t too many people around. We headed first for the Gran Plaza — no delayed gratification for us — and on the way noticed some people staring up into a tree. 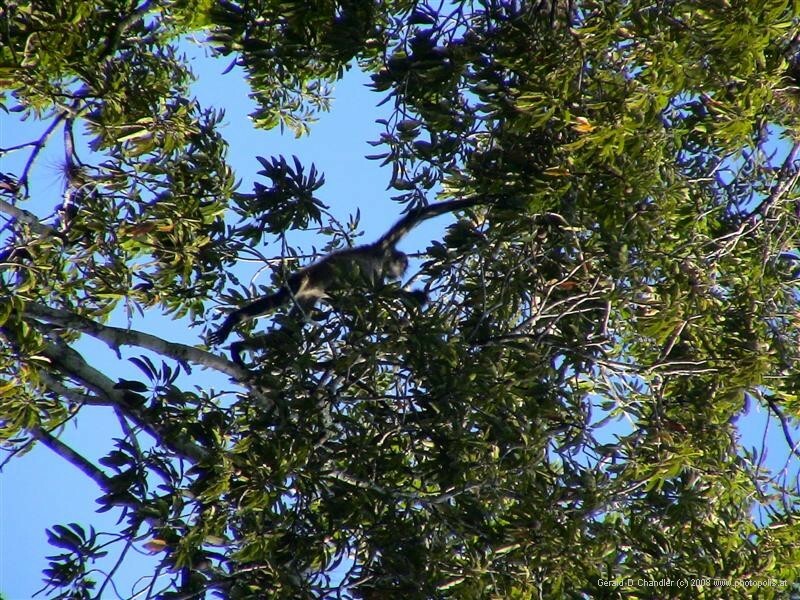 We stopped and got to watch spider monkeys feeding on the leaves of the tree. We were quite excited and very pleased we had brought our new binoculars with us. From there we walked and got our first sight of the back of Temple 1 with the early morning sun just hitting its back. It was astonishingly high and terrifyingly steep. Jan simply gawped in admiration while Gerry took pictures and then we walked around the temple to its front and caught sight of the North Acropolis and Temple 2 on two of the three other sides of the Grand Plaza. We were lucky to see the Grand Plaza in the early morning hours when it was still shaded from the sun by Temple I and enveloped in an air of mystery that we shared with just a few others. People used to be allowed to take the stone steps to the tops of Temples I and II on the Grand Plaza but because of wear and tear and a few deaths that has now been prohibited. We spent our time sitting on the lower north acropolis, admiring the two temples and the harmony of the whole. 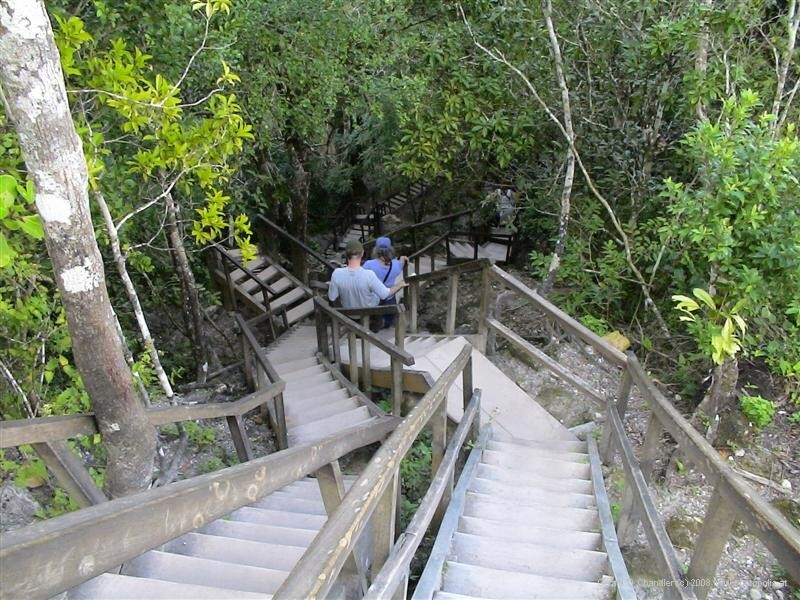 We did take and were very impressed by the steepness of the stairs that go up Temple V. We sat up there to eat our box lunch — there are no restaurants on the site. And then we walked on and took and were even more impressed by the double height stairs that go to the top of Temple IV. The ancient stone steps on both temples are either so steep or so decrepit or both that we would never have attempted them. 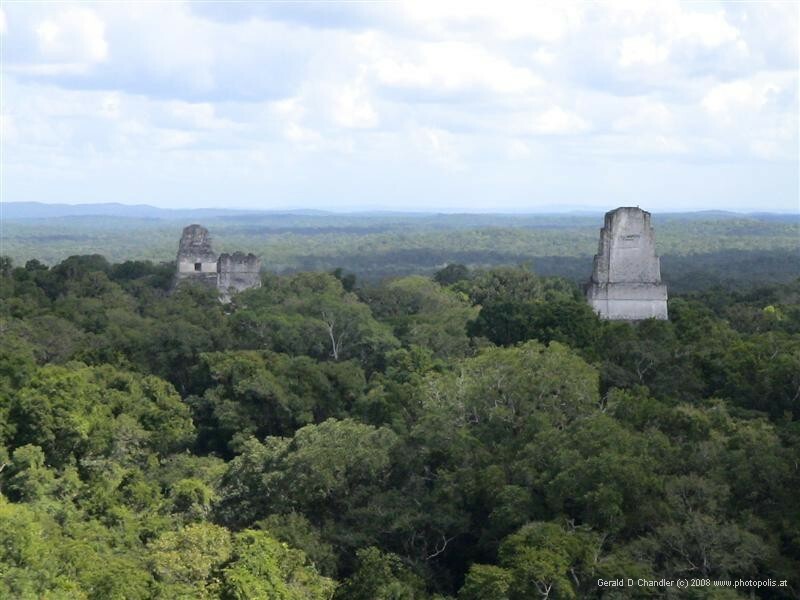 On top of both we were rewarded with sweeping views of the jungle that surrounds the site and embraces the temples that stick up from their leafy green surrounds. Temple IV hasn’t yet been restored, except for the roofcomb and temple on the top of the pyramid. Perhaps it never will so that there will be one reminder of what the site was like when it was rediscovered by the world in the 1880’s. The roofcomb by the way, is a tall decorative structure added to the temple's roof. You can see the front and back of the roofcombs on Temples II and I respectively on the photo below. We've already told you about the spider monkeys. 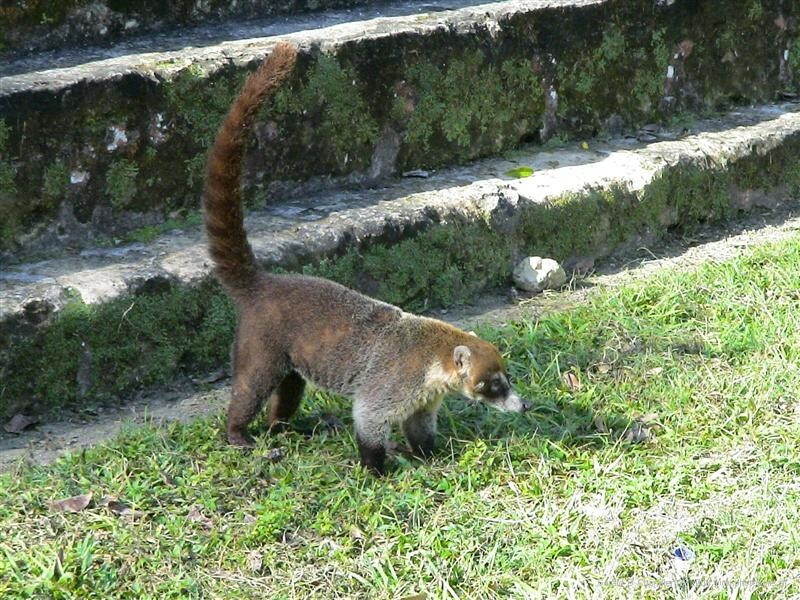 Our next wildlife sighting was a family group of coatimundis, a dog-sized relative of the raccoon, wandering around the South Acropolis looking for food. They look so funny with their tails sticking straight up in the air like a Japanese tour guide's umbrella. But that's not all. From the top of Temple IV Jan got to see her first free and wild toucan sitting on a top branch of a tree just below the top of the temple, but only for a few moments. Search as we would, we could never locate the howling monkeys though we did see the spider monkeys, rainbow turkeys, a parrot, several unidentified birds, and lots of coatimundi. After eight hours of constant wandering and having seen all of the more central parts, Jan elected to return to the car while Gerry went on to see the northern groups. In any other place these outer groups would be famous if they were by themselves. 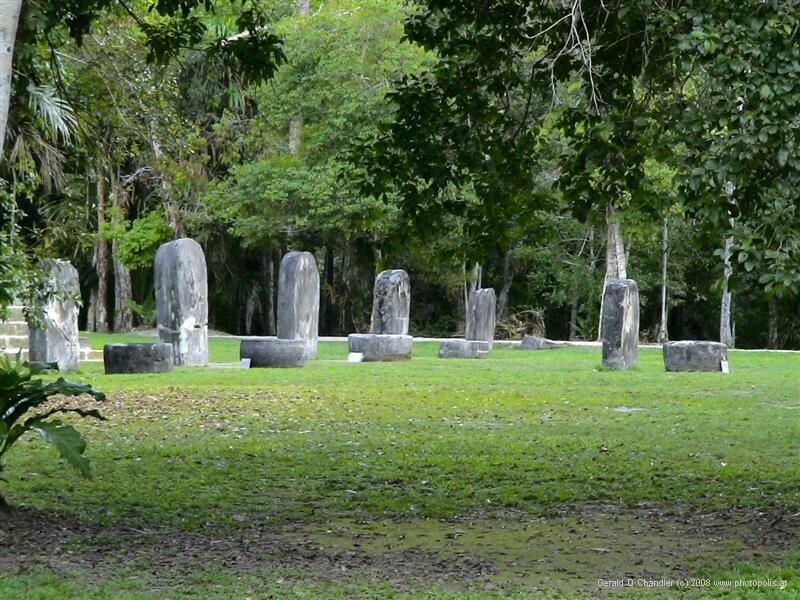 But here they are overshadowed by the Tikal giants. The traditional, guide-led route takes you to the outer groups first. That way you build up things until you get to the magnificent central Grand Plaza. We did things in the opposite order: Jan knew that Gerry would walk her legs off and she wanted to be sure to have seen the major sites before crying Uncle! We got, as noted, the side benefit of having the Grand Plaza nearly to ourselves. It is said that seeing the whole site requires a walk of more than 10 km. This seems to be an underestimate because Gerry walked that and more, and still missed the southeast group. 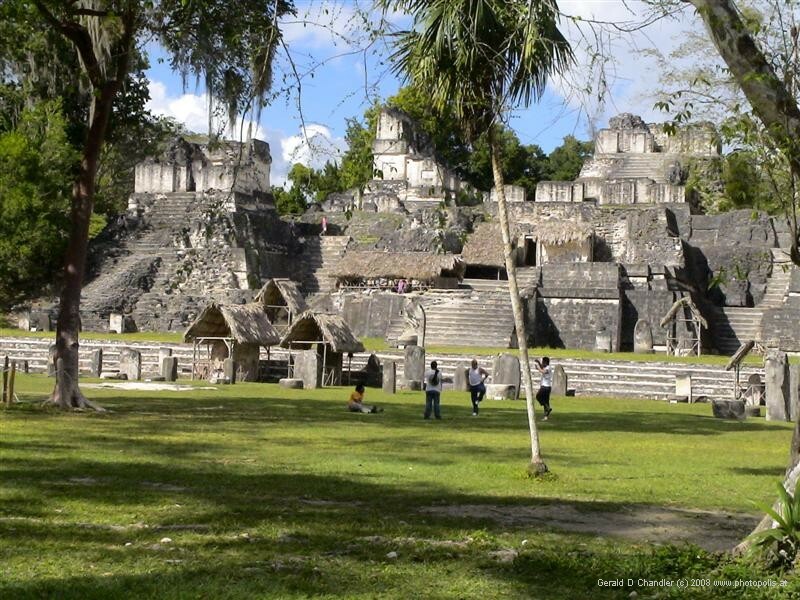 To sum up, in Tikal we found something that more than equals Palenque. We rate it a must-see for everyone. 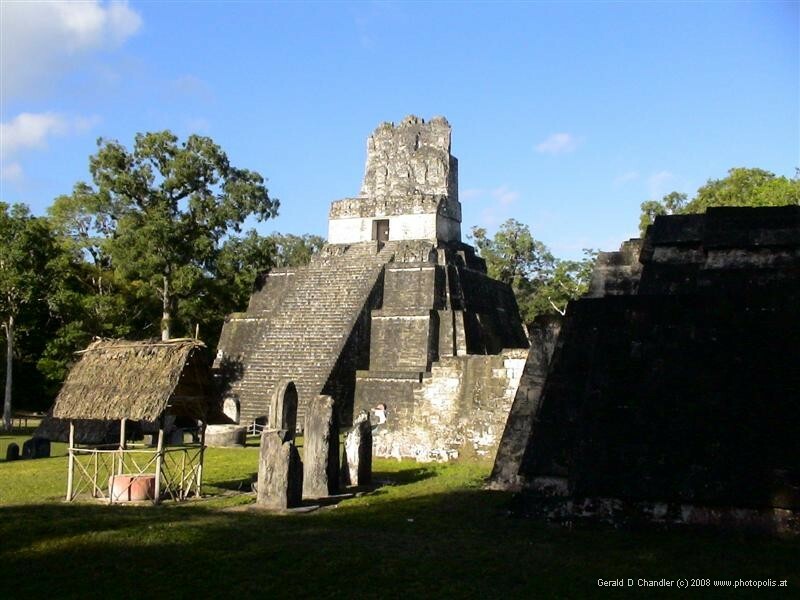 It is a magical place where you get to see four giant temples and many more smaller buildings built by the Mayans, all while listening to the howler monkeys howl, the toucans touc, the brown jays jay, the parrots parrot.... well, you get the picture. Wildlife and ancient history in a very easy to take package. We spent the whole day there, almost from sunrise to sunset and still didn't manage to see it all.